﻿ News Bharati - Mars is more porous than we thought! News Bharati - Mars is more porous than we thought! Mars is more porous than we thought! California, Feb 1: With unusual ways and equipment, NASA’s scientists have found a breakthrough study that, Mars is more porous and less compacted. This study is based on NASA’s Curiosity Rover latest observations. The researchers used non-science engineering data to understand Mars’s surface and measure how dense the rocks are in the 96-mile-wide Gale Crater. This research is revolutionary because this study gave a new approach to exploring the planet as the Curiosity rover continues to drive around on it. 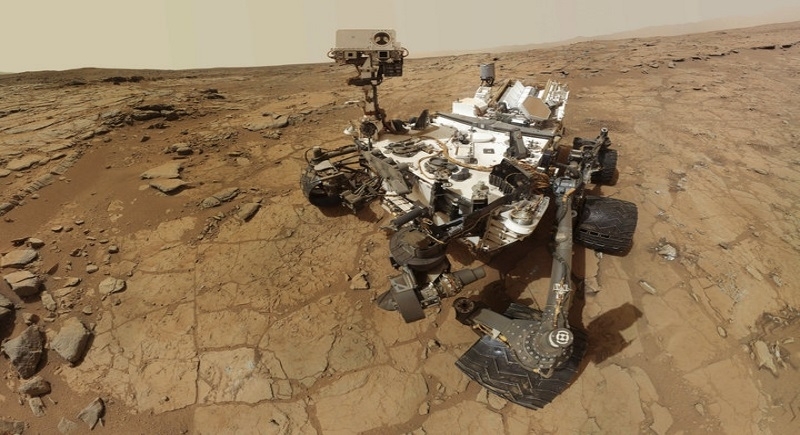 Just like a smartphone, Curiosity carries accelerometers and gyroscopes. Moving your smartphone allows these sensors to determine its location and direction. Curiosity's sensors do the same thing but with far more precision, playing a crucial role in navigating the Martian surface on each drive. Knowing the rover's orientation also lets engineers accurately point its instruments and multidirectional, high-gain antenna. By using this data from the first five years of the mission, the paper’s authors measured the gravitational force of Mars on the rover. For astonishment of scientists, the gravitational force decreases as Curiosity ascends Mount Sharp. Scientists could use the findings to help understand where places like Mount Sharp came from, and how the Martian surface developed. "There are still many questions about how Mount Sharp developed, but this paper adds an important piece to the puzzle," said Ashwin Vasavada, Curiosity's project scientist at NASA's Jet Propulsion Laboratory in Pasadena, California, which manages the mission. "I'm thrilled that creative scientists and engineers are still finding innovative ways to make new scientific discoveries with the rover.